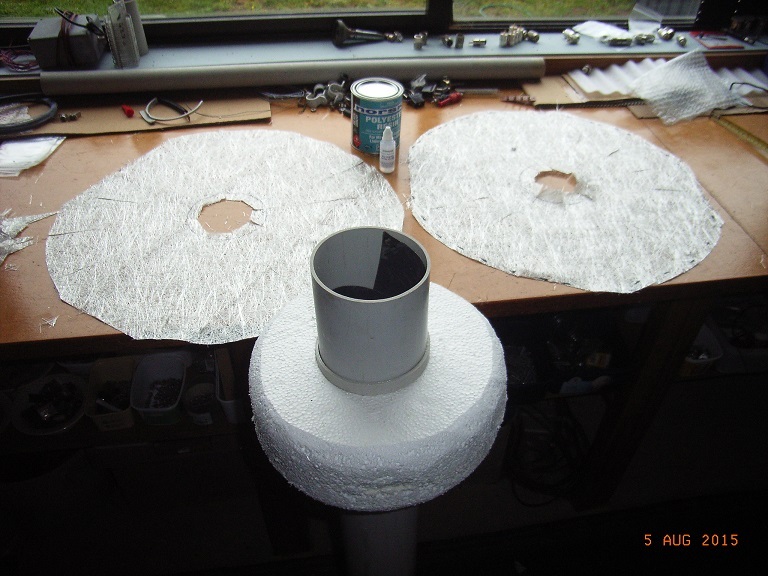 ZL1SIX Ocean Floater build and voyage archive page. 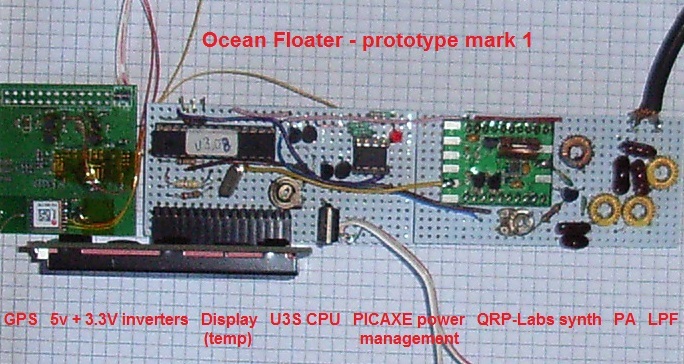 An ocean going marine buoy containing a GPS and QRP-Labs Ultimate3S based transmitter. 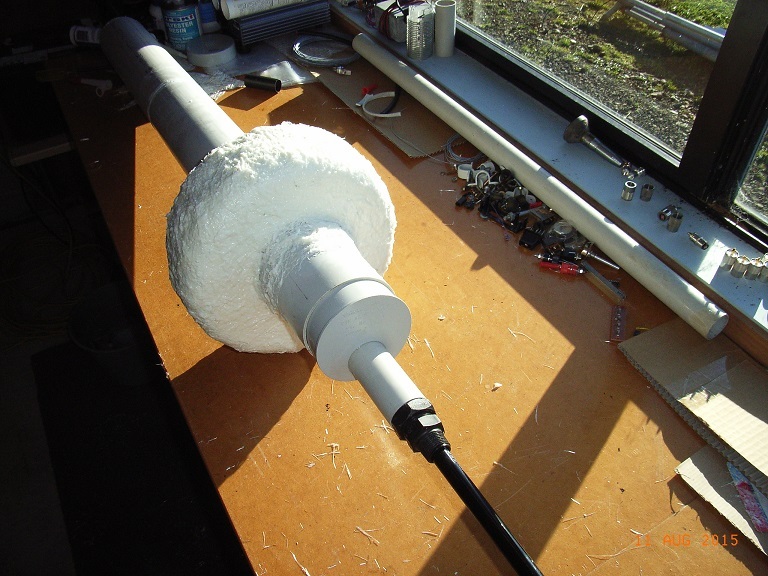 This project is intended to drift in the Pacific Ocean at the mercy of the tides, currents and wind directions while sending its position, battery voltage and temperature information via HF radio telemetry in WSPR and JT9 modes. 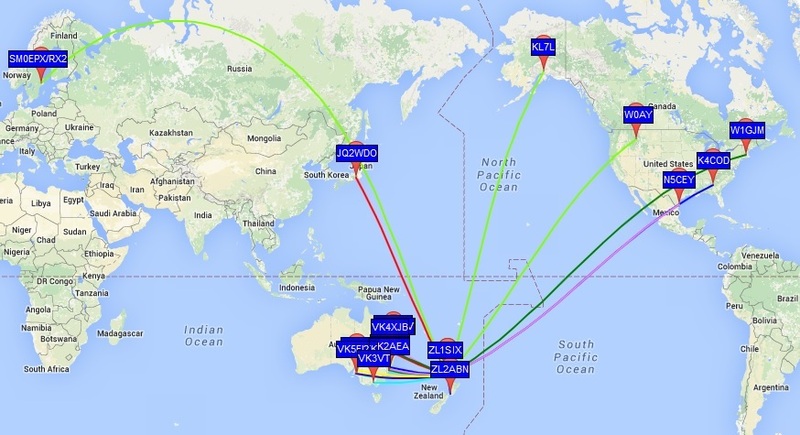 It will transmit once per hour on the 30 meter (10 MHz) Amateur Radio band in WSPR and JT9 modes. 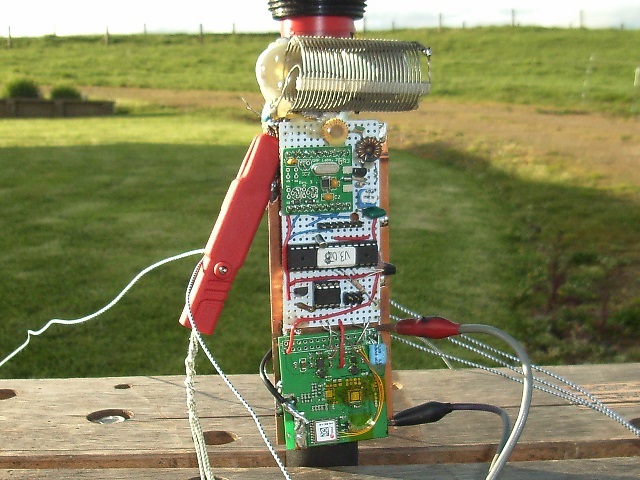 The 'dial frequency' to receive the Floater signal is 10.1387 MHz USB (the normal 30m band WSPR frequency), and the JT9 signal can be found just above the "WSPR band" at 1730Hz on the waterfall. John & Lyn Martin on the yacht Windflower and the rest of the Island Cruising Association Pacific cruising fleet left Opua in the Bay of Islands on Saturday 14 May. 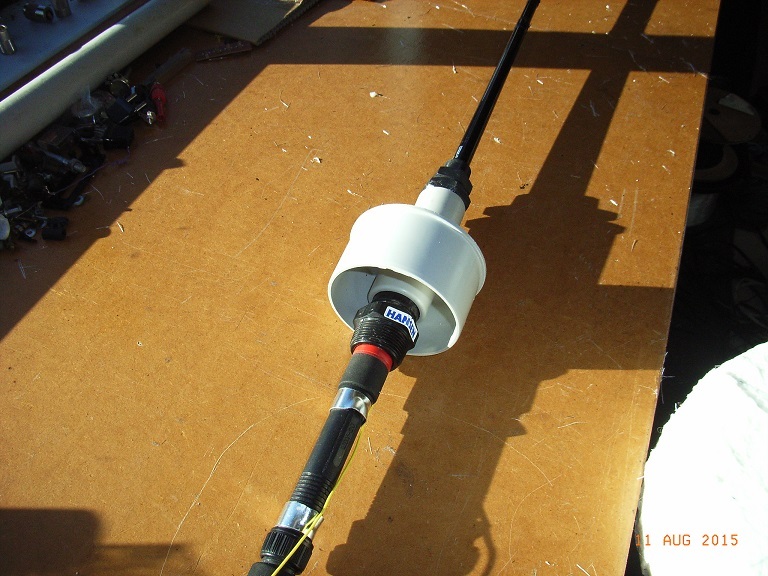 'The Floater' transmitter is active but not radiating at full efficiency due to the lack of ground plane and the proximity of the yacht's solar panels and rigging. It will be interesting to see the signal difference when 'The Floater' is actually lowered into the ocean in a few days time. After looking at the rather vague ocean current maps available on the Internet, we intend to drop 'The Floater' into the ocean at about 26 degrees south latitude, a few hundred km SW of the Minerva Reefs. 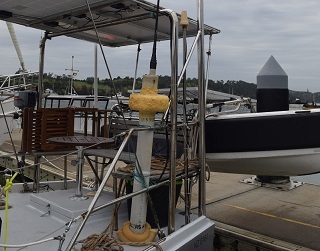 Delivering the Floater to the yacht at Opua Marina and tied on board ready for departure. 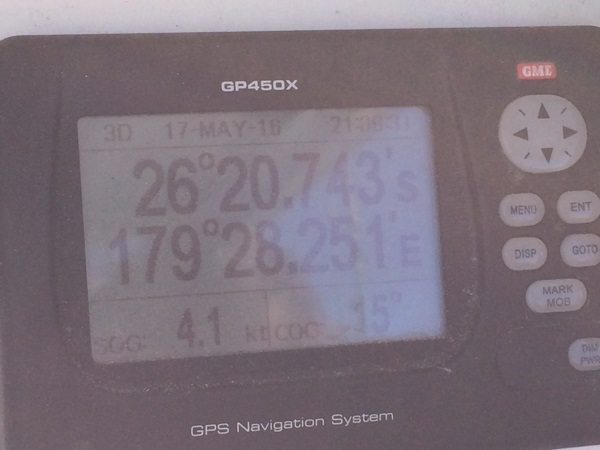 Position as indicated on the yacht's GPS at the release point. Between 06 UTC 25 May 2016 and 04:04 UTC 05 June 2016 there was a UTC time update problem. This was traced to a bug in the PICAXE power saving program that was not apparent during weeks of testing and the first two weeks at sea. During that 2 weeks the Floater was transmitting once per hour, but the timing was 10 seconds early ... however, thanks to an idea by Remco PA3FYM and implementation by Wolf DL4YHF, a version of Wolf's fine rsNTP program was developed with a "Floater Time Offset"! Since 04:04 UTC 05 June 2016 the Floater transmission timing has reverted back to UTC. If you are using rsNTP with the special 10 second offset, de-select this in the 'Options'. 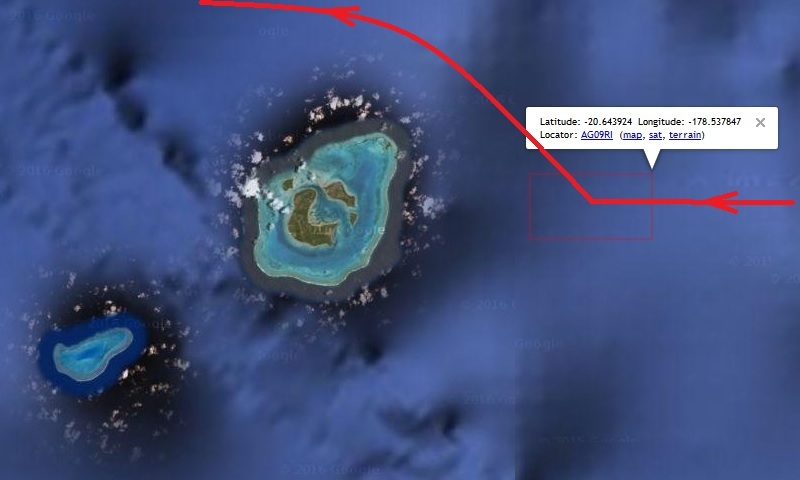 The larger island near AG09RI is Ono Levu in the Ono-i-Lau group south of Fiji. The Floater had been travelling steadily west but the ocean current sweeping around the island turned the Floater northwards. Latest news - 09 April 2017 - Tropical Cyclone "Cook"
On 08 April a weak tropical cyclone (hurricane) developed over Vanuatu at about 500km (300 miles) NE of the Floater. 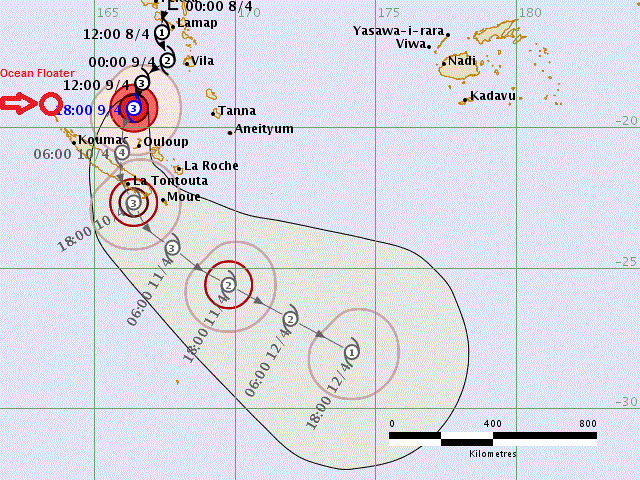 This storm was updated to Cat 2 on 09 April and is travelling SSW towards New Caledonia. Depending on the actual track, by 10 April it could be in the vacinity of the Floater and strengthened to Cat 3 with winds up to 85 knots (157 kmph - 97 mph - 43 m/s). update 12 April 2018: Cyclone Cook turned SE and had little effect on the Ocean Floater. 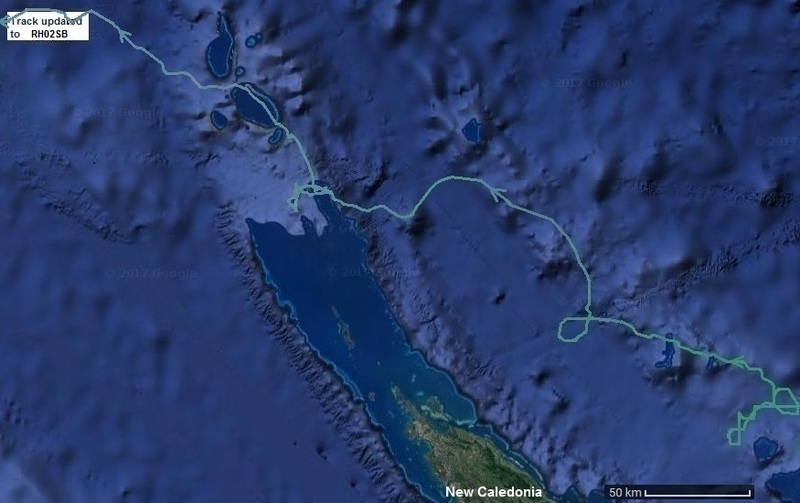 The Floater's drift track near the reefs at the northern end of New Caledonia from March to 25 April 2017. The Floater actually crossed several submerged reefs and passed through three lagoons before emerging into the open ocean again. 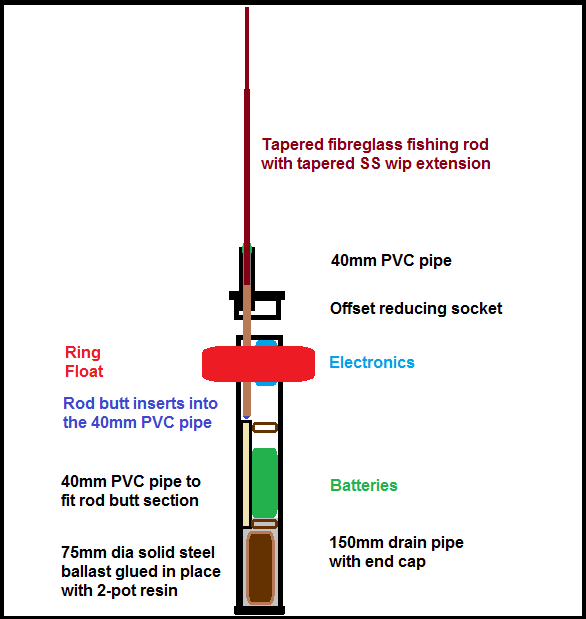 A mish-mash of ideas ... PVC drain pipe buoy with "anti-bobbing" float, fishing rod + tapered SS whip antenna, GPS and high efficiency inverter power supplies, QRP-Labs U3S items, PICAXE power management controller to extend battery life, battery bank of 18 alkaline D-cells in 3-series x 6-parallel configuration for power supply and as part of the buoy stability ballast. The anticipated life from the 18 x D-cell alkaline battery bank is difficult to estimate due to the inverters drawing more current as the battery voltage declines, but between 12 and 14 months is expected. 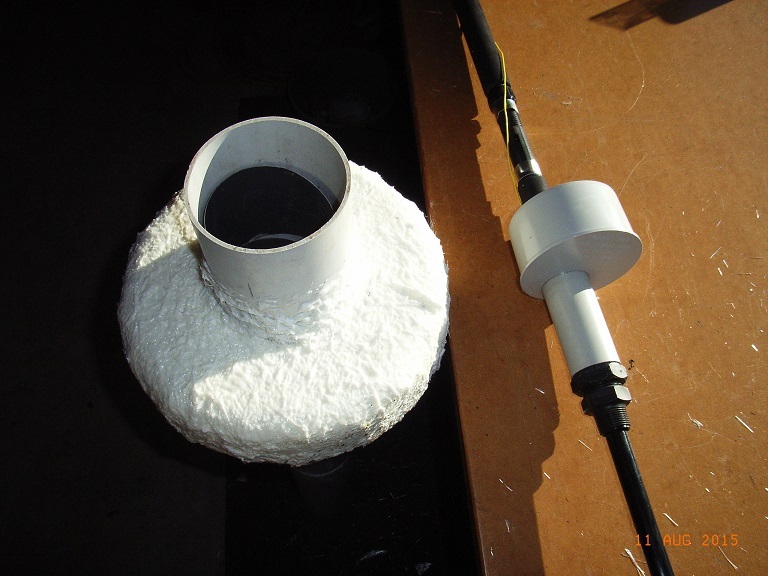 A solar charged lithium battery power system was tested but discarded due to the panel size required and potentially poor 'survivability', both due to salt build up on the panels (further reseach has shown that assumtion to be completely wrong), and being on the ocean during a storm as being like in a washing machine! The small panels tested gave very poor solar charge performance under cloudy skys. A low drain, high efficiency 3.3V inverter/regulator and PICAXE 08M2+ at 1.1mA current consumption to provide power management of the GPS and TX to extend the battery life. 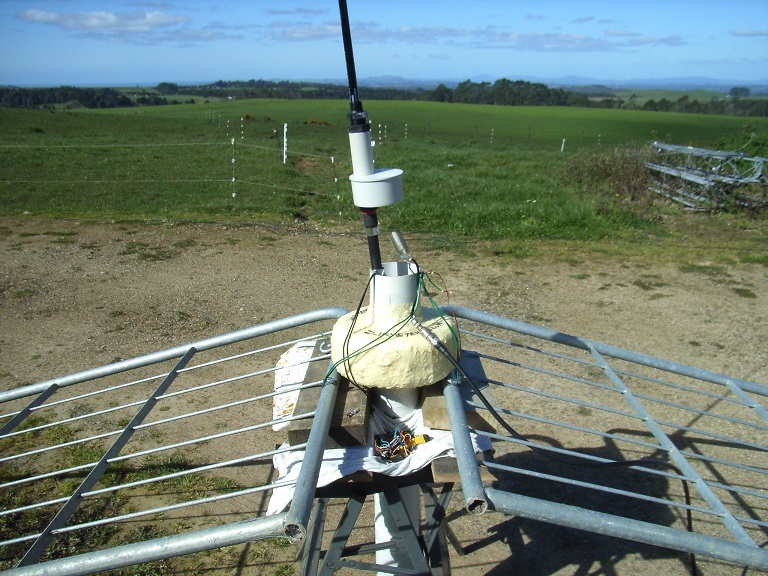 3.3V is also supplied continuously to the GPS 'backup' pin to retain data for a fast GPS 'warm' start (typically less than 15 seconds if there are sufficient satellites in view). This consists of 3 alkaline D-cells connected in series to give a nominal 4.5V supply, and 6 sets in parallel to increase the battery bank capacity. 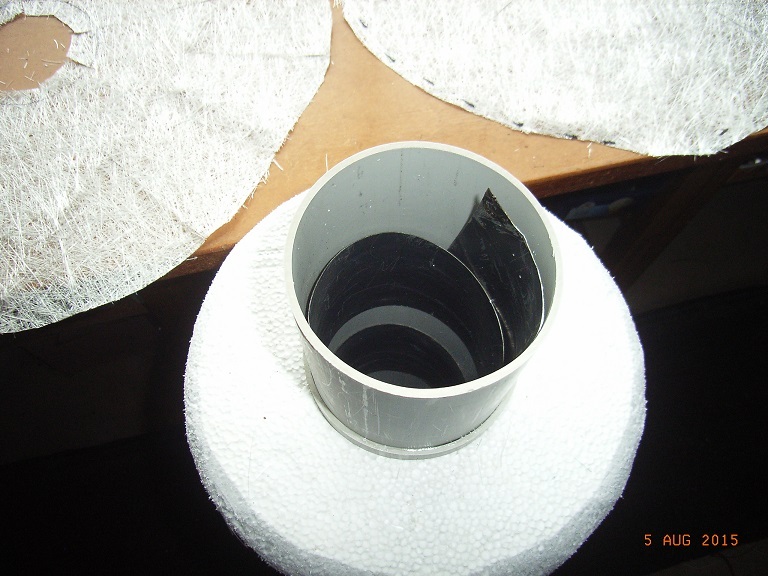 There are series diodes from each parallel battery string to isolate them in case one battery develops a fault. The series diodes drop the effective battery voltage by 0.7V to become a nominal 3.8V supply. Alkaline D-cell battery capacity at a low discharge rate is 20A/hr per string of cells, so 6 strings in parallel gives 120A/hr total capacity. The average power consumption of the transmitter is just 11mA/hr but the drain on the batteries increases as the 'supply' voltage reduces due to the operation of the 3.3V and 5V regulators when in boost mode. This makes the expected life difficult to calculate accurately and battery capacity is also dependent on temperature (higher when warm). 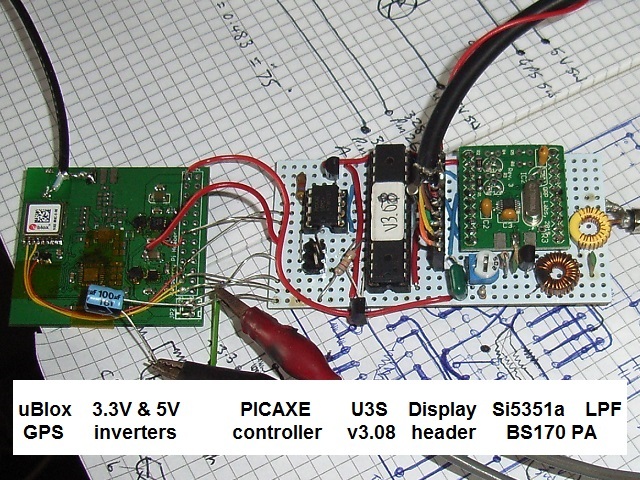 An A-D input on the PICAXE controller is monitoring the 'supply' voltage and the PICAXE firmware tests the voltage at the beginning of each hour long cycle. It is set to shut the system down when the 'supply' voltage reaches 1.2V to prevent eroneous operation (the boost regulator minimum input voltage spec is 0.8V). A 1.2V 'supply' voltage via the isolation diodes is 1.9V at the batteries, or 0.63V per cell which is just below their nominal 'flat battery' voltage specification. 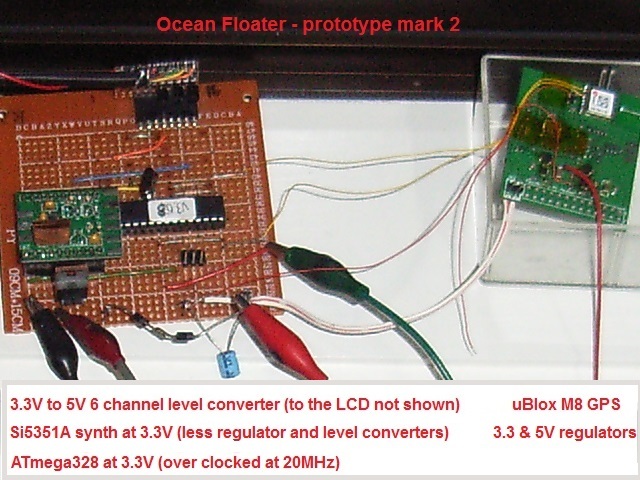 The QRP-Labs U3S and QRP-Labs Si5351A synthesizer kit have been modified to work at 3.3V. The ATmega328 is out of spec (overclocked) while using the 20MHz clock crystal at 3.3volts, but somehow it still runs reliably (so far!) The brown-out 'fuse' setting in the ATmega328 had to be altered to suit the lower operating voltage. The QRP-Labs synthesizer kit has had the LM317 regulator and level converter FETs removed. The unused 'clock output' tabs on the synth PCB have also been cut off to make the board smaller. Testing with the L-match network at the base. 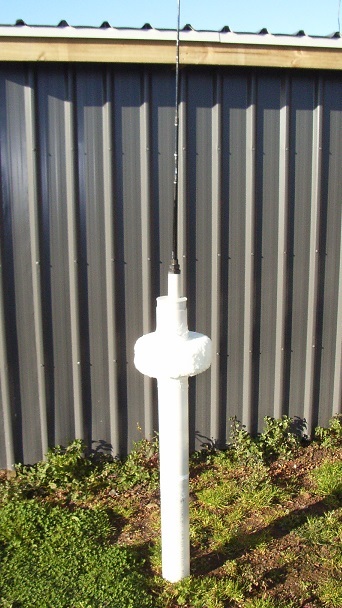 The galvanised steel farm gates are the ground plane! 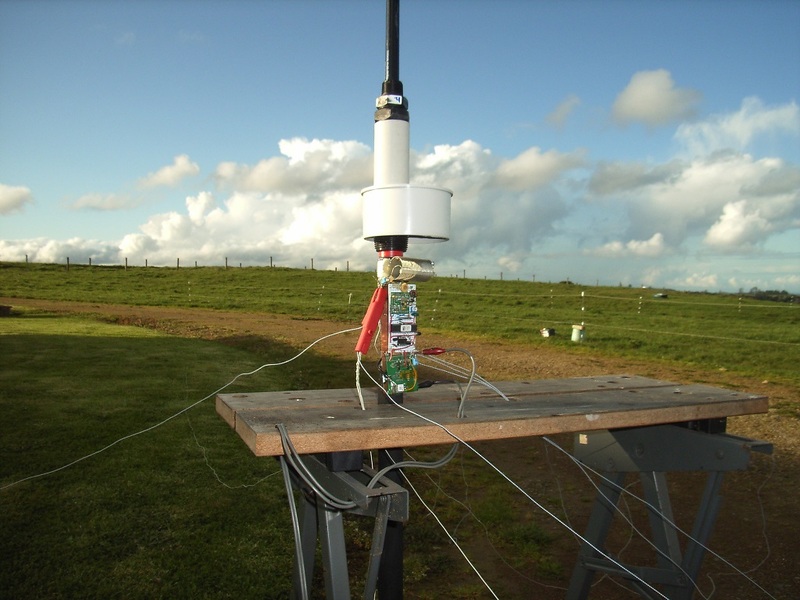 Final TX and L-match configuration being tested against 8 wire radials as a ground plane. Closer shot of the TX and L-match. 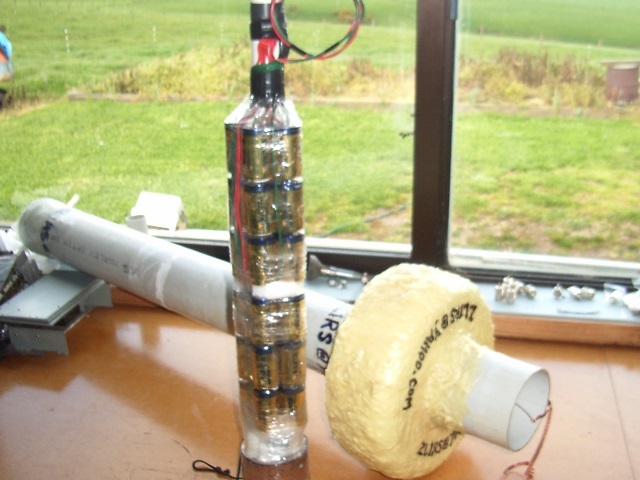 Battery pack and floater body tube. 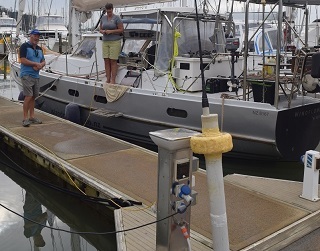 - John & Lyn Martin ... for releasing the Floater well off shore from their yacht "Windflower"
- to the several people for their encouragment and moral support!